It is Birthday Week in our house. And yes I said week. I like to celebrate my birthday for a whole week so why cant C? I may be MIA from the blogging world this week I have a ton of things to do!! We are just doing a family party at our house but its till a big deal to me. Along with my million things to do I am very emotional. I dont want him to grow up. I can't believe he is already 1. Where did my itty bitty baby go? I want him back. Dont get my wrong I love my big boy but there is nothing like holding a sweet little baby. Ugh my heart hurts. So yes I have a million things to do and I will probably be crying through all of them. Happy Birthday! Good luck with the party! 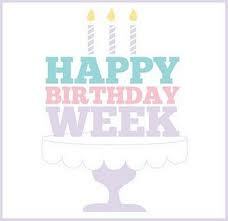 Happy birthday week, C!!!! Can't wait to hear all about it:) These babies are growing up way too fast!!! Happy Birthday to Baby C! I hope you enjoy...I am sure it all goes way too fast!